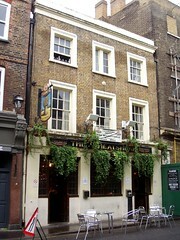 The Wheatsheaf was a Young's pub (managed by the Red Car Pub Company) right next to Borough Market. It closed on 7 January 2009 due to work associated with the Thameslink upgrade (to make room for the new railway viaduct being built over Stoney Street) and moved to Wheatsheaf, SE1 1TY, around the corner on Southwark Street. Young's retained the lease of the Stoney Street building and reopened it as a pub in December 2012. We haven't visited the new incarnation yet, but our notes on the old one are below. London Reconnections has some photos of the situation as of late 2010 (scroll down); the top floor of the building has been completely removed, but the ground and first floors remain in place. London SE1 also talks about the work and the possibility of a beer garden when its reopened. The information below is retained for people who want to know what it used to be like in its first incarnation. Young's pub right next to Borough Market. Inside, the decor is quite basic, with bare floorboards (and not in a gastropub way). There are maybe three or four tables, but it's mostly standing room only. There seem to be separate entrances for the public bar and the other side, but they connect to each other at the back. There's a dartboard at the back too. Kake and friends visited on a Monday early evening in December 2008. All six handpumps (three on each bar) seemed to be on, with St Austell Tribute (£3.05/pint), Young's Winter Warmer, Young's Ordinary, Courage Best, and a couple of others. Rock music was playing, but relatively quietly. There were about 20 people in at 4:30pm, with a surge after work (5:30pm-ish) which quietened down again by 7pm. They may serve food, but it's not clear at what times (the website has no further details of food). Last visited by Kake and friends, 22 December 2008. Opening hours taken from Young's website, February 2008. Last edited 2012-12-17 14:12:34 (version 26; diff). List all versions. Page last edited 2012-12-17 14:12:34 (version 26).